A new Environmental Protection Agency (EPA) funded project led by Purdue University strives to help solve the problem. The organisms include the bacterium Legionella pneumophila, which causes Legionnaires’ disease; the brain-eating amoeba Naegleria fowleri; Pseudomonas aeruginosa, an antibiotic-resistant pathogen associated with serious illnesses; and Mycobacterium avium, which causes respiratory illness, especially in immunocompromised people. Purdue will work with researchers at Michigan State University and San José State University to better understand and predict water quality and health risks posed by declining water usage and low flows. The group is funded with a $2 million grant from the EPA. The three-year project, which begins January 2017, also will be funded with $1.1 million from non-federal sources, including Whirlpool Corp., Citizens Energy Group, and the Avon Community School Corporation. 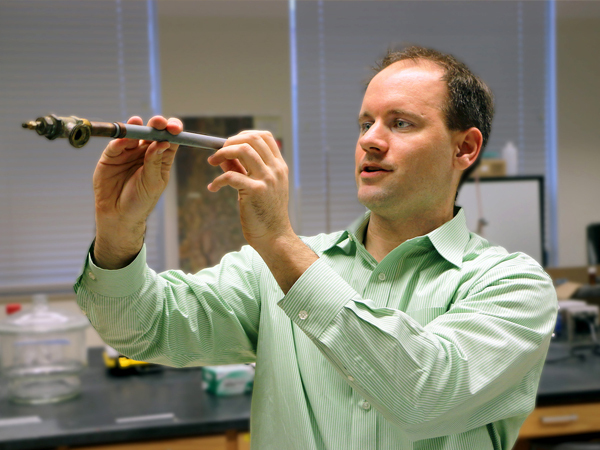 Purdue’s Andrew Whelton, assistant professor of environmental and ecological engineering, leads a project to help address potential health hazards posed by low-flow building water systems, which may cause an increase in disease-causing organisms and harmful chemicals. “In low-flow systems, we have discovered that the water that reaches your faucet is going to be much older by the time it gets to you,” said Whelton, who described the problem during a recent conference, Dawn or Doom ’16, at Purdue. A video of the talk is available. Whelton, the project’s principal investigator, will work with a team that includes Jade Mitchell, an assistant professor in MSU’s Department of Biosystems and Agricultural Engineering; Janice Beecher, director of the Institute of Public Utilities Policy Research & Education at MSU; Joan Rose, the Homer Nowlin Chair in Water Research at MSU and the 2016 Stockholm Water Prize Laureate; Pouyan Nejadhashemi, an associate professor at MSU’s Department of Biosystems and Agricultural Engineering; and Juneseok Lee, an associate professor and California Water Service Co. Chair Professor in San José State’s Department of Civil and Environmental Engineering. Whelton’s existing plumbing technology testing facility will be expanded at Purdue to examine plumbing component impacts on drinking water safety. His team has previously identified evidence-based methods to decontaminate chemically contaminated building plumbing. “We will develop the knowledge that identifies piping network design and operational conditions that can decrease microbial and chemical risks,” Whelton said. A Web-based “decision support system” also will be created. “Health risks in residential and commercial buildings caused by pathogen proliferation must be minimized through water infrastructure design, operation and maintenance decisions, and codes,” Whelton said. The team will test hypotheses using various systems, including those in a residential home converted by experts from Purdue and Whirlpool Corp. into the most efficient domicile possible — a “net-zero” structure called the ReNEWW House; the National Conservancy’s Efroymson Conservation Center in Indianapolis, considered the most sustainable office building in the state; Avon Middle School North in Avon, Ind. ; and two office buildings in Michigan. “My colleagues and I designed the project to investigate drinking water quality where people live, where they work and where they send their kids to school. This was spurred by input we received from various stakeholders, including homeowners, parents and government officials who have contacted us in the past for assistance,” Whelton said.